Top | Barefoot Contessa How Easy is That? When I need to get dinner together in a hurry, this is about as easy as it gets. 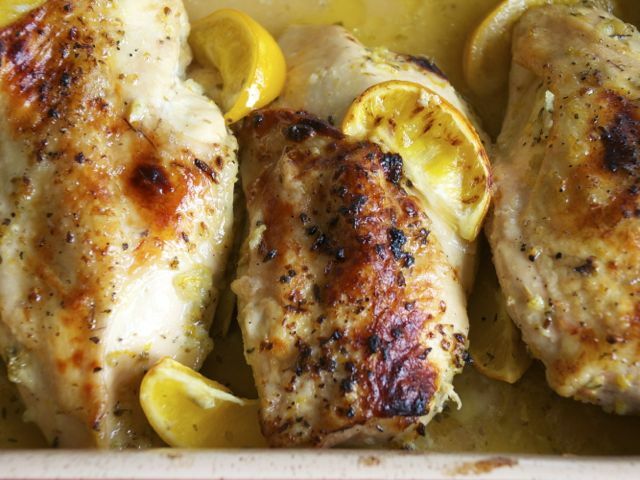 White wine, garlic, and oregano give this chicken great flavor. I make some basmati rice or couscous with toasted pine nuts to soak up all those lemony juices, plus a vegetable like steamed haricots verts, and I’m done. Warm the olive oil in a small saucepan over medium-low heat, add the garlic, and cook for just 1 minute, but don’t allow the garlic to turn brown. Off the heat, add the white wine, lemon zest, lemon juice, oregano, thyme, and 1 teaspoon salt, and pour into a 9-by-12-inch baking dish.